2002-04-29 Assigned to WATER STREET ADVISORS, INC. reassignment WATER STREET ADVISORS, INC. ASSIGNMENT OF ASSIGNORS INTEREST (SEE DOCUMENT FOR DETAILS). Assignors: CHARNLEY, JAMES A. A process for selecting investments from a population of book-valued collective funds uses a determination of the past average investment performance of funds within an asset class. Past performance is measured in a “means-variance” analysis. The selection process determines variances from a theoretical population distribution that is uniformly random with a normal distribution around the measured past performance averages for the asset class. Investment return is calculated as the average of past periodic returns. Investment risk can be the variance of those past returns around their average, or the covariance of those past returns with those of a benchmark that can be the population average of past periodic returns or past periodic returns of an associated market index. Variances are identified preferably by dividing or scaling the performance distribution into four to twenty-five areas of what should be equal-sized fund populations assuming a normal distribution of risk and return about the center of each for the asset class population. The actual population in each equal area is measured, and these measurements are ranked. Investment selection is for those funds found in areas having a high ranking. The selection is improved eliminating from the selected funds the smallest funds in the population. The selected group exhibits a performance significantly stronger than the “asset class” average performance for at least thirty-six months. This application claims the benefit of U.S. Provisional Application Serial No. 60/342,825, filed Dec. 28, 2001. In the prior art, many attempts have been made to predict differences in future investment performance arising between funds within an asset class. Those that undertake such predictions use the tenets of  Modern Portfolio Theory (1952) to frame their efforts. In MPT, Dr. Harry Markowitz introduced the approach of evaluating investments in terms of a utility function that reflected both the expected return and the expected risk of an investment. He plotted past investment return (benefit) against the risk to the investment associated with that level of return (cost). This risk-return relationship is what is commonly referred to as ‘investment performance’ within the industry, and is denoted by the term ‘risk-adjusted returns’. The prevailing academic theory regarding the distribution of the investments within an asset class in terms of their investment performance has assumed that such distribution is random. The population density of investments within an asset class, measured in terms of the joint probability function of risk and returns, is assumed to conform to a normal, symmetrical distribution. Professor William Sharpe popularized this belief in his 1964 thesis,  Capital Asset Prices: A Theory of Market Equilibrium Under Conditions of Risk, and elsewhere, teaching that the relationship between the return for the investments within an asset class and the risk of these investments could be plotted in a two-dimensional risk-return space as a straight line that runs from the return on a zero-risk investment (typically taken as a U.S. Treasury Bill) through a rate of return associated with the average risk and return for the asset class or an associated market index. A deviation in an investment's performance from this ‘securities market’ or ‘equilibrium’ line has been characterized by Professor Sharpe and others as ‘random error’, the population of these random errors making up a normal distribution around the equilibrium line and summing to zero. Prior to the last few years, consideration of investment selection theory and methods for predicting differences in future investment performance have been primarily academic. Overviews of this academic work appear in “On Persistence in Mutual Fund Performance”,  Journal of Finance (March 1997) by Mark Carhart, and “New Facts in Finance”, Economic Perspective, Federal Reserve Bank of Chicago (1999) by John Cochrane. Much of this work has common roots in, and builds upon, the general theoretical framework of the work of Markowitz and Sharpe. The focus of this work has been, in general, either a study of (i) whether mutual funds can out-perform the general securities market, or (ii) whether the future performance of funds can be predicted from past performance. The second question is pertinent here. Processes to identify predictive differences have usually relied on methods to form groups of funds within an asset class population based on similar levels of past returns, risk or investment performance. While in general, earlier work following Markowitz and then Sharpe found no predictive value, later studies have shown short-term persistence in investment performance, but this persistence has been found to be short-lived, and only to work in certain market cycles. For example, if the analysis of past performance statistics produced a positive future alpha or differential return for a selected group, it might be minor and temporal, such as a 1% advantage lasting less than two years. Still later commentators have cited qualifying factors such as extraordinary market conditions and reversal of cycles, to explain away patterns that might otherwise be profitably exploited in an analysis of past performance. The process of this invention is repeated periodically, e.g. 36 months after a selection of the funds. The funds are sold and the proceeds reinvested, again following the process of this invention. FIG. 15 is a prior art graph corresponding to FIGS. 1-3 illustrating alternative methods of measuring differences in investment performance. Prior art FIGS. 1-11 are discussed in detail below both in connection with actual prior art methods as well as the method of the present invention. Such discussions as to the method of the present invention are employed to illustrate the applicability of such method to known concepts and principles in the prior art figures but it is not meant to show that the method of the present invention is disclosed or taught in such prior art figures. where, the average return for an investment within an asset class R i is defined by a line from the average return of a riskless investment Rf of slope “beta” β1, through the net average return for the asset class or an associated market-index (Rm−Rf). Of note in this equation, is the term ε, known as random error. CAPM assumes that a deviation in investment performance for an individual investment within an asset class from this equilibrium line is the product of ‘random error’, and that the term ε is a random variable of normal distribution and zero mean. Therefore, heretofore, the conventional wisdom has been to assume that the distribution of performance differences for a population of investments within an asset class is symmetrical and that their density conforms to that of a normal distribution around the equilibrium line, and to discount evidence of population densities within an asset class populations as calibrated for investment performance that may countermand this assumption as an anomaly or measurement error. The selection process of this invention displays a population of book-value funds on a Markowitz two-dimensional, “mean-variance” graph. The average return for an investment is marked on the y-axis and the variance of returns on the x-axis as shown in FIGS. 1-3. This invention also uses, in its presently preferred form, a Sharpe equilibrium line (FIGS. 1-3) drawn from a point of the average rate of return for a riskless asset through a point for the average returns and returns variance for the asset-class average, or an associated market index. FIG. 4 illustrates the assumptions of CAPM and other asset pricing models, where point  10 is a point on the asset-class equilibrium line denoting either average return or return variance, and line 11 is the curve describing a normal distribution around that point. The most rigorous interpretation of CAPM assumes a normal distribution curve; less rigorous interpretations are satisfied with a symmetric stable distribution around an equilibrium line. Such an asymmetrical distribution, a skewed asymmetry, is illustrated in prior art FIG. 5. Point  20 is a point on the asset-class equilibrium line denoting either average return or return variance. Line 21 is the curve describing a asymmetrical distribution of positive skewness around that point. (Although not illustrated, the curve could just as well be of negative skewness, with the long tail to the left of a point of the equilibrium line). There also exists a general condition of leptokurtosis in the distribution of risk-adjusted returns for funds within an asset class over most periods. Leptokurtosis is a condition of ‘peakedness’ whereby the density of a population closest to its central point is higher than expected under the assumption of a normal distribution. Such a leptokurtic distribution is illustrated in prior art FIG. 6. Point  20A is a point on the asset-class equilibrium line denoting either average return or return variance. Line 21A is a curve describing the distribution frequency of the funds around this point for a normal distribution. Line 22A is a curve describing the distribution frequency of a leptokurtic population of funds. To illustrate this invention, prior art FIG. 7 shows the boundaries of population distribution around an equilibrium line within an asset class as a parallelogram  31 congruent to that equilibrium line 33 (or E) and comprising points 38, 39, 40 and 41. Finally, if one were to first create quartile categories of return variance by rank-order of the range of values, and then rank-order and categorize the funds in each returns-variance category by average return, the asset-class population would form a grid of segments or areas  50 as shown in prior art FIG. 11. FIGS. 8-11 are examples of the general ways in which practitioners have attempted to identify differences in past performance which predict differences in future performance. Industry experience with these methods is that they do not lead to economically viable results. Any future differences identified either have not been of the magnitude or persistency to provide a positive economic return, or could be explained as the product of extraordinary conditions in markets external to the asset class, and thus not necessarily replicable across all economic conditions. The process of categorizing a population by rank-ordering of its performance values ignores any spatial differences in the distribution of that population. By definition, each portion is constructed to contain an equal percentage of the population. For the example immediately above, each category or area  50 within the 16-square grid of prior art FIG. 11 would contain 6.25% of the asset-class population. In practice, to create this uniformity of population distribution, the dividing lines would be mutually spaced less evenly than shown to reflect the tendency of population to group closer to a center point than an extreme point. In contrast, as shown in FIGS. 12-14, the process of this invention relies on the identification of differences in the distribution and population density of performance values within an asset class to construct categories of prior factors that will predict future performance. In this categorization process, the spatial characteristic of the asset class population are paramount. In contrast, FIG. 12 of the method of the present invention illustrates a typical actual population distribution with the population density in each area  50 displayed in a percentage of the total population (100%). Rank-ordering and regrouping these sixteen squares by population size generates four population groups of significant size variation. Table A below illustrates this for the distribution shown in FIG. 12. The method of the present invention uses this density variation to predict a consistent and regular difference in future performance. The group IV formed of the four most densely populated areas  50 out-performs the asset-class average by the greatest margin. The group I of the four least populated areas 50 under-performs that average by the greatest margin. This variation is statistically significant for all periods and asset class configurations tested, and is economically significant in cases where the variation in performance among the funds of an asset class is economically significant. Additionally, grouping by population size increases the effectiveness of other characteristics differentiating funds within an asset-class in predicting differences in future performance. Differences in sales expenses and asset-size have not heretofore been found to be sufficient indicators of future performance differences across asset-class populations. However, selecting for funds within the most-densely populated group of an asset class on the basis of differences in these characteristics consistently yields significantly stronger future performance across all periods and asset classes tested. 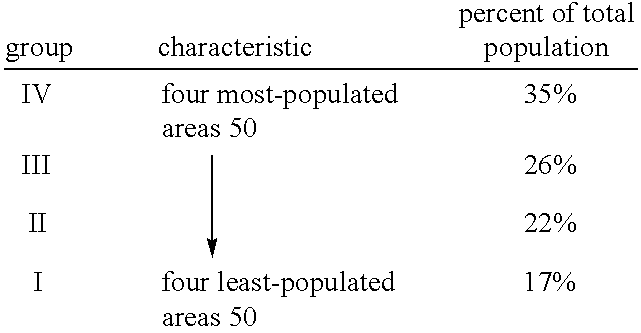 In an alternative embodiment of the method of the present invention, a significant variance in population densities is selected for the four areas  50 closest to the center point for average returns and returns variance for the population, relying on the condition that asset class populations of funds are usually leptokurtic. The density for these four closest areas 50 within the aforementioned sixteen-square example is similar to that produced by combining the four most-densely populated areas 50—34 % of the total asset class population. The advantage in future investment performance enjoyed by this closest-group over their peers within the asset class is also on par with that created from the selection of the four most-populated areas 50 for the periods and asset classes tested. FIG. 13 identifies group IV as funds selected from the most populated four areas  50 in FIG. 12 through to group I as funds from the least populated four areas, and group V is those funds within the most populated four areas whose asset-size is greater than the lowest 1% of the asset class and who carry no sales load. The distribution of future risk-adjusted returns at 36 months from selection is shown in FIG. 13. The difference in future performance produced by selecting for the most populated areas and for funds within the most-populated areas whose asset size is greater than the lowest 1% of the asset class and carry no sales load is similar to those funds selected from the four areas 50 closest to the asset class center point of the like sales load and size characteristics. Step 4. A fund's returns variance is ‘standardized’, a statistical technique whereby a measurement is transformed into units of the population's mid-point and average variance. Using this standardized measure of returns variance, the individual members of the asset class are segmented into groups by their relative distance and direction from the calculated mid-point of asset-class returns variance. Using, for example, quartile segments or “portions”, as in FIGS. 11 and 12, the population is first divided into four groups by their distance from the mid-point for returns variance. Then, a mid-point for average returns and the standard deviation of average return is calculated for each of these portions, the measurement of the average return for each of the funds in each portion is standardized and then each portion further divided by quartiles based on the funds distance and direction from the mid-point average return for each portion. This segmentation divides the asset class into sixteen areas  50 in terms of investment performance. Note that this segmentation of the population is drawn at dividing lines that assume the quartiling of a random or normal distribution of the population. Such a quartiling entails drawing a dividing line at ±0.675 standard deviations from the mid-point of returns variance to create four portions, and then ± standard deviations from the mid-point for average returns for each of the portions to create sixteen squares of assumed equal population. Other segmentation scaling criteria could also be used, such as deciles, octiles, and halves and still be within the scope of the present invention. A segmentation or “scaling” into four to twenty-five areas  50 is recommended. A finer scale, in excess of twenty-five segments, has been found to lead to inadequately populated portions in smaller or greater-skewed asset classes, and to excessive volatility in the results. A scaling below four is likewise less reliable. The most useful scale for marking these segments appears, from trial-and-error, to be between 0.5 and 0.1.5 standard deviations. Wider or narrower segmentation patterns tend to obscure differences in investment performance. FIGS. 14a-14 h illustrate various exemplary alternative segmentation strategies of a normally distributed population in accordance with the present invention. Step 6. The asymmetry in asset-class population density is used to select for a group of funds whose future investment performance will be stronger than the average for its asset-class for up to thirty-six months following selection. Specifically, those funds within the most-densely populated quartile, such as group IV in the foregoing Example, are selected. These funds, so selected, have been found to identify a group that will generate a consistent and statistically significant level of investment performance above that of the average of their respective asset class peers across a variety of market conditions. The selected “high” ranking area  50 or composite area is typically the densest one or more areas, but the selected area need not be made up exclusively of the highest ranking areas in terms of population size. As discussed in more detail below, for example, other combinations of areas 50 which result in a composite area whose population density is higher than anticipated under the assumption of a normal distribution can be effective, as well. In the past, analysts have looked for and found no advantage in future investment performance for selecting for larger funds within an asset class. The present invention confirms these findings—for an asset-class population, little if any advantage can be had from selecting those funds whose net assets are greater than 1% of the assets for the largest funds in the asset class. However, that changes for funds within the more densely populated areas  50 whose net assets are greater than 1%. For all population-density groups other than the group of least-populated segments (group I), selecting for the larger funds significantly improves future investment performance. Again, as shown in FIG. 13, using the size discriminations described above, the future adjusted risk return of the portfolio is significantly improved. selecting the group for investment based on variances in the population distribution from that of a normal distribution of said past investment performance around the mid-point of investment performance for the population. 2. The process of claim 1, wherein said population distribution is the display of investment performance, denominated as the average of past periodic returns as a function of investment risk, where the risk in turn is denominated in a manner selected from the group of risk measures consisting of: (i) as the variance of those past periodic returns around their average for each of said book-valued funds in said population, and (ii) the covariance of those past periodic returns to the average past periodic returns for the population for each of said book-valued funds in said population or those of an associated market index to said population. sectioning each of said equal-sized population portions into equal-sized population areas under the assumption that the frequency distribution of values within each population portion, as calibrated for investment returns, conforms to a normal distribution from the center point of investment returns for each respective population area. 4. The process of claim 3, wherein said step of sectioning of said population distribution into said equal-sized population portions is by drawing a dividing line at 0.675 standard deviations from a center point of investment risk, and then drawing another dividing line, also at 0.675 standard deviations, from the center of said average returns for each said portion of the population. 5. The process of claim 1, wherein said past performance is calculated for a number of periods adequate for generating a valid measure of returns variance consistent with preselected conventions of measurement in use by the investor. 6. The process of claim 5, wherein said past performance is determined for a period of at least the five preceding years. selecting for investment a group of funds that lie in at least one of said equal-sized population areas that has a high rank relative to all ranks assigned. 8. The process of claim 7, wherein said step of selecting for investment a group of funds is from a composite area formed from at least two of said equal-sized population areas having a high rank relative to all ranks assigned. 9. The process of claim 3, wherein said step of assigning each of said equal-sized population with a rank is executed according to proximity to the center point of an asset class for average return and returns variance in descending order from closest to furthest from said center point, according to the group of funds that lie in at least one area that has a high rank. 10. The process of claim 8, wherein said step of selecting of a group of funds for investment is from a composite area formed from at least two of said equal-sized population areas having a high rank relative to all ranks assigned. eliminating from said group of funds selected for investment those funds that have a front-end sales charge, deferred sales charge, or redemption fee. eliminating from said group of funds selected for investment those funds whose net asset value is less than 1% of the net asset value of the largest funds in said population. (e) selecting for future investment those book-valued funds that are found in at least one said equal-sized areas having a high measured population size ranking, relative to all ranks, when so ranked. 14. The process of claim 13 wherein said population distribution is a display of investment returns, denominated as the average of past periodic returns as a function of investment risk, denominated as the variance of those past periodic returns around their average for each of said book-valued funds in said population. 15. The process of claim 13 wherein said population distribution is a display of investment returns, denominated as the average of past periodic returns, as a function of investment risk, denominated as the covariance of those past periodic returns to the average past periodic returns for the population for each of said book-valued funds in said population or those past periodic returns for an associated market index. sectioning said population distribution into from four to twenty five of said equal-sized areas under the assumption that the frequency distribution of values within the asset-class population, as calibrated for investment return and risk on that return, conforms to a normal distribution from a center point of investment return and risk, respectively, for a given asset class. 17. The process of claim 16, wherein said step of sectioning said population distribution into said equal-sized areas is by drawing a dividing line at 0.675 standard deviations from a center point of investment risks to form portions of said population distribution, and then drawing a dividing line also at 0.675 standard deviations, from the center of said returns for each said portion of the population distribution to produce said equal-sized areas. 18. The process of claim 13, wherein said past investment performance is calculated for a number of periods adequate for generating a valid measure of returns variance consistent with preselected conventions of measurement in use by an investor. 19. The process of claim 18, wherein said number of periods is at least five years preceding the investment selection. 20. The process of claim 13, wherein said asset class is a grouping of the funds by unique commonalties in pattern and level of said past return variance. 21. The process of claim 16, wherein said step of sectioning is dividing said population distribution into sixteen equal-sized areas that can be assumed to be of equal population size under the assumption of normal distribution. 22. The process of claim 13, wherein said selecting comprises combining the population of two or more of the most populated areas so ranked to form a single composite selected area. combining a population of two or more areas ranked as closest to a center point for asset class average returns and returns variance into one composite selected area. investing in those funds that populate said single composite selected area. eliminating from said single composite selected area funds that have a front-end sales charge, deferred sales charge, or redemption fee. eliminating from said single composite selected area funds those whose net asset value is less than 1% of the net asset value of the largest funds in said population. creating an investment portfolio by holding funds in said single composite selected area for at least thirty-six months. (ii) using proceeds of said selling to further invest in a group of funds. Abrantes-Metz et al. 2012 Libor manipulation?